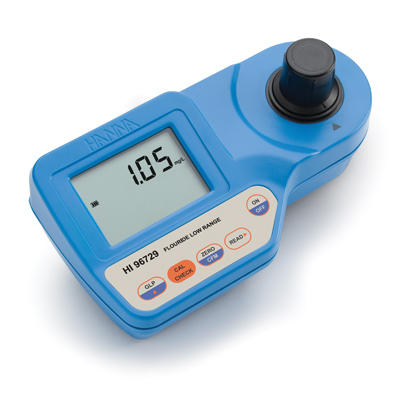 The HI 96729 meter measures the fluoride (F–) content in the 0.00 to 2.00 mg/L (ppm) range, in drinking, surface and waste waters. The amount of reagent is precisely dosed by use of the supplied automatic pipette for maximum repeatability. This meter uses an exclusive positive-locking system to ensure that the cuvette is in the same position every time it is placed into the measurement cell. It is designed to fit cuvettes with a larger neck making it easier to add both sample and reagents. The cuvettes are made from special optical glass to obtain best results. HI 96729 is supplied sample cuvettes with caps (2), 9V battery and instruction manual. HI 96729C includes sample cuvettes with caps (2 ea. ), 2000 ?L automatic pipette with instruction sheet, 9V battery, cloth for wiping cuvettes, instrument quality certificate, instruction manual and rigid carrying case.